Stardust began in 1998with just a small collection of 6 pop icon designs hand printed onto t-shirts. The collection quickly grew and is inspired by pop culture, punk rock, politics and kitsch. Stardust now has a very funky and fashionable range of clothing styles for everyone. From their baby styles of rompers, playsuits, topsand more to stylish fashions for both boys and girls right up to adults t-shirts and even matching sets for mother & daughter or father & son. Many of the t-shirts can also be personalised with names and ages making them a great gift for birthdays. I was asked to choose any item of clothing and it was quite a hard decision as everything is so fabulous. In the end I chose a lovely girls winter skater dress for Jordanna to wear. This dress is part of the Stardust Funky girls clothes range and is ethically made. It's in skater dress style based on the same style of ice skaters dresses. It comes in four different colours. The colour I have is red & black and it also comes in purple, green and black and in sizes 0-6months to 12-13 years so I may invest in a smaller one for Izebella too. 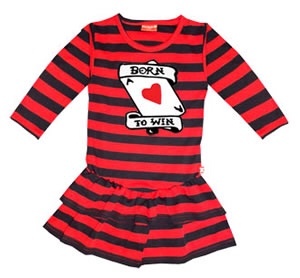 The dress features a quirky logo “Born to Win” which suits Jordanna just right as she is always winning. This dress will look great with tights or leggings or even on its own and feels warm on (according to Jordanna) perfect for still looking fashionable in the coming winter months. The dress is carefully made from 100% super soft cotton and can be machine washed and tumble dried. Jordanna loves getting new clothes and of course this dress is no exception. I chose a size 7-8 as she is quite tall for a six year old and also will get more wear out of it in the colder months. It fits well and with lots of room for a growing girl. There are lots of other winter dress styles to choose from which you can view here. The dresses start at £28. Stardust clothing is sold in over 200 shops worldwide and has grown into a popular brand. The quality of their clothing really stands out with the use if vibrant funky colours and detail in their garments.